A selection of web fares - some great bargains!!! * Dublin city centre fare includes Dublin Bus route 145 (as far as Leeson Street) or LUAS tram to city centre (or Connolly/George's Dock). This is an informational website with practical and useful information about the South Tipperary railway line and complementing bus routes. It is hoped that the website will be of interest and assistance to the general public, locals and visitors alike. Places served: The line provides an useful link between Waterford city, the towns of South Tipperary (from east to west: Carrick-on-Suir, Clonmel, Cahir, Tipperary) and Limerick Junction. It is shown in blue on the map section hereunder. Onward connections are available at Limerick Junction (e.g. to Dublin, Cork, Limerick & Kerry). Onward trains depart from an adjacent platform with no footbridge or subway to negotiate. 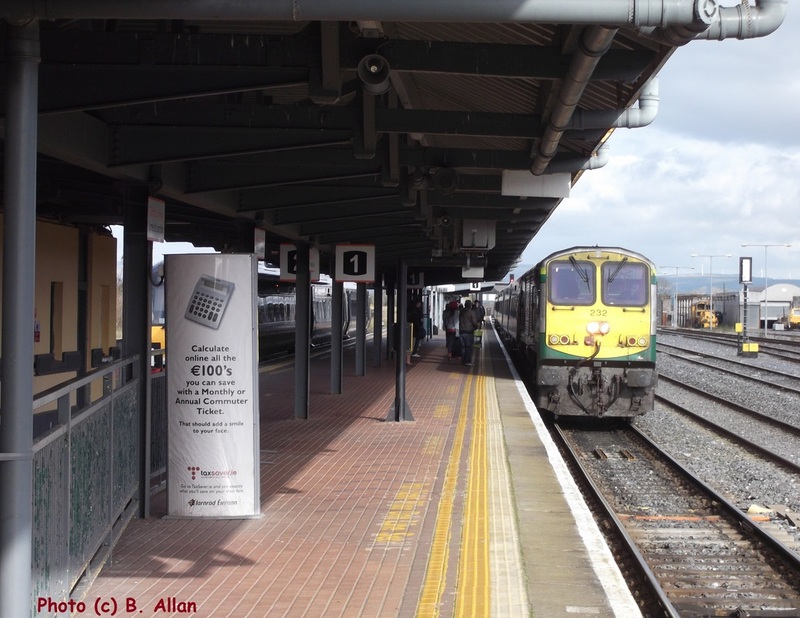 There is also a once a day each way opportunity to connect with the Kilkenny/Carlow/Kildare/Dublin line train at Waterford (entails a wait of 1 hour to 1 h 30 at Waterford). There are two trains in each direction daily though there are no services on Sundays. The timetable may be viewed on the Irish Rail website. The train offers the fastest public transport journey times for most journeys between the towns of South Tipperary and to/from Waterford. The train has wheelchair areas, luggage and bicycle racks, toilets (including infant changing facility). Table and airline type seating is available. One can play a board game or avail of the free Wi-fi to surf the web/ catch up on the news/ e-mails. At seat power sockets are available. This 56-mile long cross-country single track line is quite scenic – if you wish to relax and enjoy the passing scene the detailed description of the line on A journey along the line page may be of interest. Visit Cahir Castle by train! Visitor attractions range from the castle and Swiss Cottage at Cahir to the county museum in Clonmel and a further castle in Carrick-on-Suir. Tipperary town is close to the Glen of Aherlow - great walking countryside. Each town has its own heritage/historical trail allowing one to explore buildings and features of interest around the town. All towns have a variety of accommodation, places to eat and shop with Clonmel having a particularly extensive array of shopping facilities. For people living or staying in South Tipperary, this website suggests a selection of days out by rail. Check out the Days out by train page. sample local and national rail fares may be viewed on the respective rail & bus info pages for Waterford, Carrick-on-Suir, Clonmel, Cahir and Tipperary. All-in sea and rail (SailRail) tickets which allow one to travel from any provincial railway station in Ireland to any station on the national rail network in Britain are also detailed. Disappointingly the train on the eastward continuation of the line from Waterford to Rosslare Harbour ceased in September 2010 and is replaced by Bus Éireann route 370. The journey from Munster to Britain by sea and rail via the Rosslare-Fishguard sea route is no longer realistic as a continuous journey as it entails a 6 hour break in Waterford eastbound and 7.5 hours westbound (the Waterford to Rosslare Harbour part of the journey must be made by bus). Visitors arriving at Rosslare from Fishguard wishing to explore the South and South-West of Ireland by rail may wish to consider taking the bus from the port to Waterford, overnighting in the city and continuing by rail the following day. Waterford city has a host of interesting visitor attractions. Photo above: boat train departing Fishguard Harbour. This train has dropped-off passengers bound for Rosslare and collected passengers who have arrived from Rosslare. A town bus route serves Clonmel railway station and buses to places such as Mitchelstown and Ardfinnan depart from outside the station. Bus routes also allow access to locations such as Bansha, Cashel, Fiddown and Kilsheelan. Comments, compliments & complaints about public transport: Any comments, compliments and complaints about rail, bus, ferry or tram services are best made directly to the relevant operator(s). About this website: This website is non-commercial and is just run as a hobby. It has no involvement in the operation of any public transport services. Contact & Contributions: The website is a work in progress and it is intended to develop it further over time. Constructive comments and contributions are welcome. Please feel free to get in touch via the e-mail address on the Contact & FAQs page. Wishing you interesting and enjoyable travels! Please note that minor/superficial edits may not always be listed above or on the respective pages. Note about Scribd documents: the website hosting company advise that the download function of Scribd documents is not operational at the present time. Please feel free to print off a copy of each/any of the Scribd documents. Site launched January 21st, 2013. ﻿Travelling to Britain or France via Rosslare? Check out sister website, Rosslarerailandsea which features comprehensive information on the sea routes from Rosslare & onward rail connections in Wales and France. Date of last update to this page: 24th August, 2018: website refresh & minor content edits.